Our very own Ronald Lake, team leader of our haunted house and escape room review team “Old Crow Hollow,” gives the inside scoop on something new coming to the Connecticut area for the 2018 haunting season! Last Fall, when I was making my team’s plans for haunt visits, I came across an escape room close to The Haunted Graveyard in Bristol, Connecticut. I was already planning to return to The Graveyard because it was my favorite Haunt from 2015, partly due to an incredible full-daylight walkthrough by the managers. The owner, Ernie Romegialli, has always been extremely gracious and helpful as well. So I see the listing for this escape room, “The Chamber,” and it already jumps out at me as being different from other ER’s for a couple of reasons. One, the images and marketing give it a more realistic and immersive feeling, rather than simply a room full of puzzles and, two, there’s a storyline to explain the props and décor. It just looked like this would be something more. So I read the actual story of The Chamber and it’s a fairly common one where you are trapped in a room by a serial killer and you have to escape before he returns to finish the task and make you his next victim. The difference here is that you only have 5 MINUTES to do whatever you need to do and get out the door before, in this case, two monsters burst in to seemingly mutilate you, eat you, and God knows what else to what’s left of your carcass. It just felt like this was going to be more of an experience rather than just playing a game, but how could it work having only five minutes? I just had to get in this place to give it a try and find out! So I set up a time to visit The Chamber between The Haunted Graveyard and another haunt nearby later in the evening. As much as I loved both of the full haunted attractions before and after, that short experience actually became the high point of the night, if not the whole season! Upon arrival I was pleasantly surprised to find that the co-owners of Evidence of Evil (whom I’d met back in 2015) were also the ones who designed and ran The Chamber! After a brief instruction, my team and an unknown couple were made to stand in a single file line and hold the person in front of us. That’s when they came out… the black hoods that would go over our heads. Once again, these guys had added an element of surprise and uncertainty that I wasn’t expecting and it took this simple five-minute challenge to another level. By the time they were done leading us blindfolded through the building and then outside for what seemed like ten minutes, our hearts were pounding, blood pressure way up, and the screaming, grunting, and chainsaws from unseen folks all around us added in as well. Long story short, when I heard that Evidence of Evil had something NEW up their sleeves, I was simultaneously intrigued… and slightly concerned. I know they will create something unexpected and probably unnerving, which will make it an awesome experience, but also provide an actual sense of dread – and maybe fear – to this hardened veteran of haunted attractions. What are they going to do this time? I wanted to find out, so I contacted Dave and Bobby and this is what I could find out about their plans for the 2018 season. TOCH: Other than being the owners of Evidence of Evil, what are your backgrounds in the haunt industry? EoE: Well, we are David Belas and Robert Besaw and we own Evidence of Evil. Dave: This will be my fourteenth year in the haunted attraction business. As a child, I used to be terrified of haunted houses; you couldn’t even get me to go near one! But then I started to volunteer at a local attraction in a recreational park and I was hooked! I did that for a few years and then moved onto The Haunted Graveyard at Lake Compounce. We started Evidence of Evil in 2016 and have been developing the company ever since. My “9-5” job is that I am the Assistant General Manager at a local entertainment venue. Bobby: This is also my fourteenth year in the haunted attraction business. I am basically the “Jack-of-all-Trades” and the master of none, haha. I have been a machinist for twenty years and use those skills in designing props and animatronics. I also have a passion for carpentry. Add all that to the love of scaring people and that’s where I am today! TOCH: I first met you guys when you were General Managers of The Haunted Graveyard attraction at Lake Compounce in Bristol, CT. Can you detail what kind of work you did at that attraction? 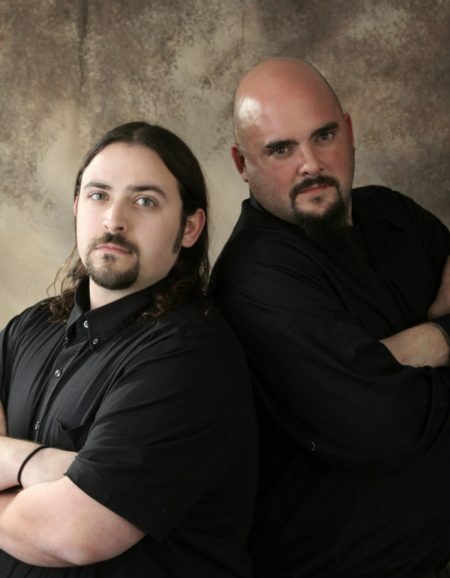 EoE: We spent almost a decade of our lives working there whether it be acting, building sets, lighting & sound design, and ultimately, becoming the General Managers of the haunt. TOCH: From my trip to the Haunted Graveyard in 2015, one of the things I was most impressed with was the ability of the actors to use timing, excellent set design and creativity to provide highly-effective jump scares… to the point that one of your actors got me during a daylight walkthrough, which is really exceptional! I’m guessing this was through your training… Is there anything in particular you do in training or coaching your actors that get them to perform so well? They are also very good at characterization; just being believable in their roles. EoE: Yes, this would be a result of our training and the standards we imposed at the haunted attraction. However, we did not do it alone. We had a crew of dedicated individuals who assisted us in ensuring that the haunt experience was “top notch.” Many of these individuals you will see working at Evidence of Evil today! I would not say there is nothing out of the ordinary that we do to train our actors except for that we rigorously screen individuals who apply and we constantly work side-by-side with them. We firmly believe that, for the most part, haunting is in your blood. It is something that you are born with. Sure, this skill can be developed, but it is key to find actors and staff who WANT to be a part of the attraction rather than just work for a paycheck. TOCH: Last year you were running an extremely intense and immersive 5-minute Escape Room called The Chamber. It had elements that added to the length and overall experience that I felt really set it apart from other escape rooms that I’d done. Can you detail more about that room’s concept, design, and how that will translate to your new attraction? EoE: So, when we started Evidence of Evil, we wanted to do something out of the ordinary (at least for our local area). It’s hard finding new ideas in the haunt world these days. We sat down one weekend and began to brainstorm different things we could do, and especially, things we could do to make people uncomfortable. These were the things that guided the design and construction of the room. The only thing we knew going into early construction was that we were going to build the lair of a madman. For 2018, we are abandoning the theme of our previous attraction and the main “Escape the Room” component to it. We have something that many people have not seen before up our sleeves, so here’s hoping! TOCH: As mentioned, you are planning on opening your own haunt this October. What details can you provide on what the theme will be, type and number of attractions, location, etc.? EoE: Forgive us for being semi-vague in our answer, but we want to maintain a high level of mystery for the upcoming season. There will be one 10 to 15 minute attraction (maybe longer) that will be located at Crystal Bees at 240 Spring Street in Southington, CT. This attraction will be very immersive and personal, exactly how The Chamber was. TOCH: For this upcoming season, I am most eagerly anticipating your haunt for a number of reasons. Based on your past work, I don’t really know what to expect as with your level of creativity; I think this will not be your typical haunt. What will set this apart? EoE: As we touched on briefly, what will set us apart will be the immersion and the intimacy of the experience. One thing we have learned from our years of experience is that we know how to make people uncomfortable and we know how to do it in ways that most people do not think of. We will not rely heavily on use of animatronics and other “eye-candy” in the haunt; but that doesn’t mean we won’t use a small number of them! TOCH: Intensity and realism were the major points of The Chamber escape room. How realistic and intense will the full haunt be? EoE: We plan on on this haunt being as intense as The Chamber if not even MORE intense. Those are the two qualities that Evidence of Evil was founded on and they will maintain to be our core values for years to come. For guests of The Chamber, they can rest knowing that THE HOODS WILL RETURN. TOCH: I expect I know the answer to this, but will the haunt be too much for younger guests, or will it be appropriate for most of the general public? EoE: The haunt may be too much for younger guests, but that doesn’t mean they can’t try it out! Believe it or not, we did have some very young guests come through The Chamber last season. They may not have been incredibly “happy” at the end of the experience, but we always make sure to let guests know exactly what they are getting into (without ruining the mystery). We are also planning on running some “low-fright” matinees for younger children (and scared adults) so they can at least see the sets and enjoy the attraction without the threat of our staff, haha. TOCH: What would you consider for this to be a success? What would satisfy you guys to continue into the future? EoE: For us, every year is a success. We are pushing boundaries that we feel are being left behind at various haunts and we always want to be the company that provides something different from the traditional haunt experience. The satisfaction part is easy. Once we open the attraction to the public each year and we hear the first screams, we know all the work was worth it. TOCH: Once this is successful, do you have plans for continuing the haunt as is for awhile, or to change it up each year? EoE: One thing about us is that we do not like doing the same thing each year. We like to switch it up for our guests and it also keeps us interested in the work. We get bored of doing the same thing repeatedly. That’s why we retired The Chamber after two seasons. We know we can provide an experience that can out-do the experience our guests had at the last attraction. TOCH: When do you plan to open this year? And how will tickets be available? EoE: We will be open weekends in October this year at dusk. 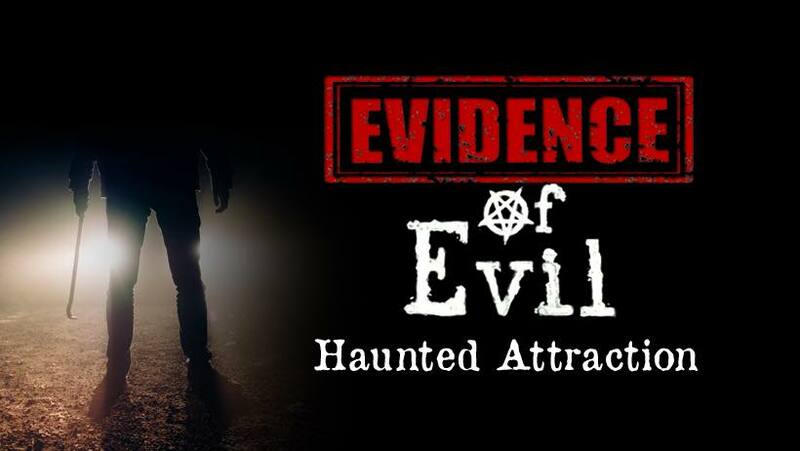 Tickets will be available at our website: www.EvidenceOfEvil.net. Each ticket will also come with a game card to the arcade inside Crystal Bees. For anyone who visits the attraction, please do try to say “Hi” to us; we love meeting everyone!